ZUKA TOOLS were created in Oregon in 2012 with the mission of providing the professional industry worldwide with high-quality and reasonable priced instruments for treatment of soft tissue injuries. Our instruments are used by thousands of clinicians around the world. They can be used with different techniques such as IASTM, Myofascial Release, or Medical/Orthopedic Massage to breakdown fascial restrictions, enhance athletic performance or remove unwanted scar tissue on patients. As a clinician you can resolve pain and tightness in the body. This approach to fascia work reduces friction which allows preciseness, sensitivity and depth that cannot be accomplished with the hands, knuckles, or elbows. 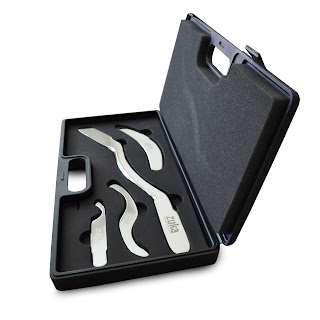 Zuka Tools make it easier to detect and treat fascia dysfunction. They magnify the abnormalities (scars, restrictions and adhesions) in the fascia and make it easier to locate the area to treat. This allows a more efficient treatment. The goal is to trigger an inflammatory healing response. This will stimulate the production of new collagen and proper, more functional, less painful healing. Great tools! I have been using them for a few months now. Very similar to GT tools without the outlandish pricing. The smaller instruments combine the utility of the extra GT instruments and make for less treatment interruption swapping tools as well as less "dishes" to clean. I compared these with ones that are slightly cheaper, read reviews and so on and settled on these due to many reasons...the price wasn't too much more but the edge/beveling is not too sharp. The weight is on the heavy side but it does work fine and helps in a way. They clean up really easily too and slide right under our coffee table so we can easily pull them out to have my husband work my shoulder muscles while we watch tv/movies. I am able to use the smaller tools on my forearms and calves pretty easily. The Zuka tools are made of a mirror finished stainless steel that I prefer when compared to the brushed finish on my portable all-in-one IASTM tool. I do find that the bar is a bit heavy and some may find that it provides a little less of the "vibration" feeback that the other three instruments in this set, and which the G** tools provide, but for me, this is not an issue because I prefer to feel for tissue drag, which the zuka bar allows for detection of as good as any instrument I've ever used. The reason the bar is heavier is because the handles are much wider, which I love for ergonomics and all-day use. Bruising can happen, known as petechiae and that's ok and normal BUT go easy when first starting. You really can "feel" the knotted tissues and gritty muscles in areas that need work so use that as a guide besides just pain. My only complaint about the larger tool is that the length pf the handles limit the surface area that can be covered. For example, you can work the top of the legs, but run into the table trying to work medially or laterally at all.